From Meersburg I caught the ferry over the Bodensee lake (Lake Constance) to Konstanz town (translated into English: “Constance”). On a Sunday the ferry operated every half hour until 11pm and then respectively each hour until the morning. I took the 6-ish ferry and the fare cost only 2,80 Euro. It was a gorgeous afternoon/evening and the ferry ride over was a short but delightful journey. This photo was taken as the ferry (Catamaran?) 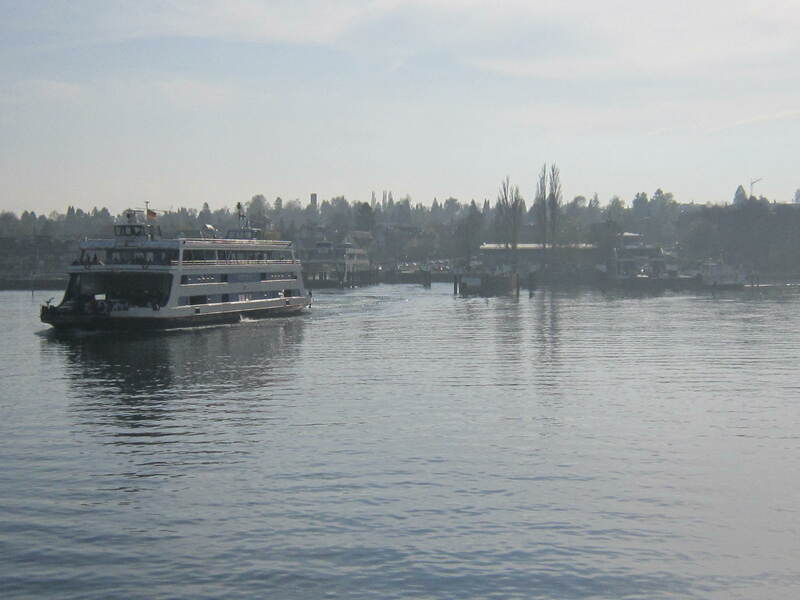 began docking into Konstanz. The post photo was taken from the front deck midway the crossing). 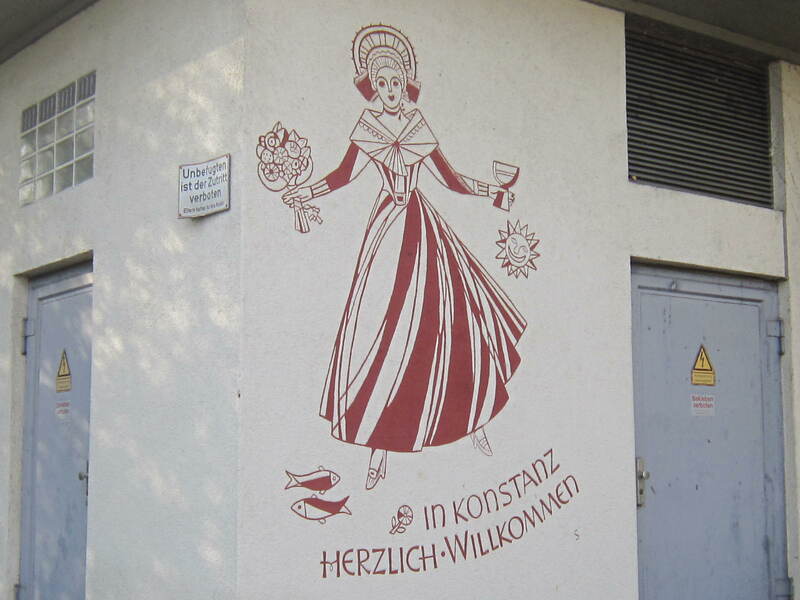 Welcome to the German town of Konstanz! Konstanz btw is a gorgeously beautiful town and well worth a visit. It was quite a tough day’s walking in the sun and I headed for a church ground to lay down my sleeping bag for the night. The priest at the church offered me a bed for the night and I gladly accepted. We ate supper together and both drank a Black Forest beer. Nice touch 🙂 I slept like a hospital patient under sedation and as I did my electronics worked overnight to restore their power to full. In the morning I ate breakfast with the priest and I said my farewells and walked to the centre of town. 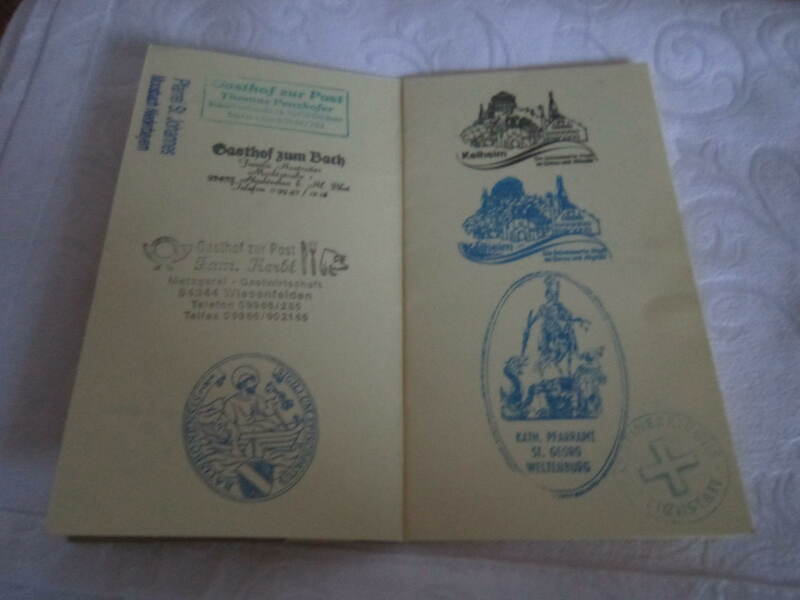 The priest btw once rode the Camino from Konstanz to Santiago AND back again! 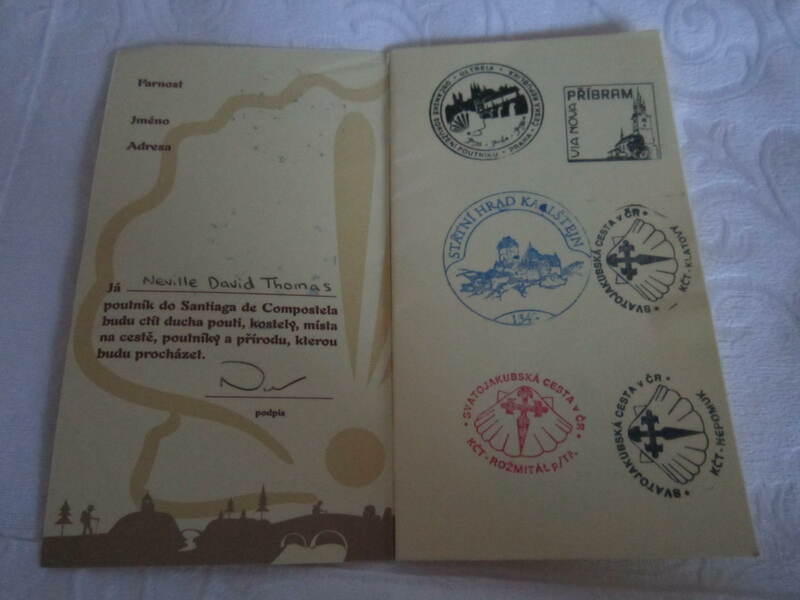 We spoke of the Camino and he gave me some valuable tips for the walk to come through Switzerland. 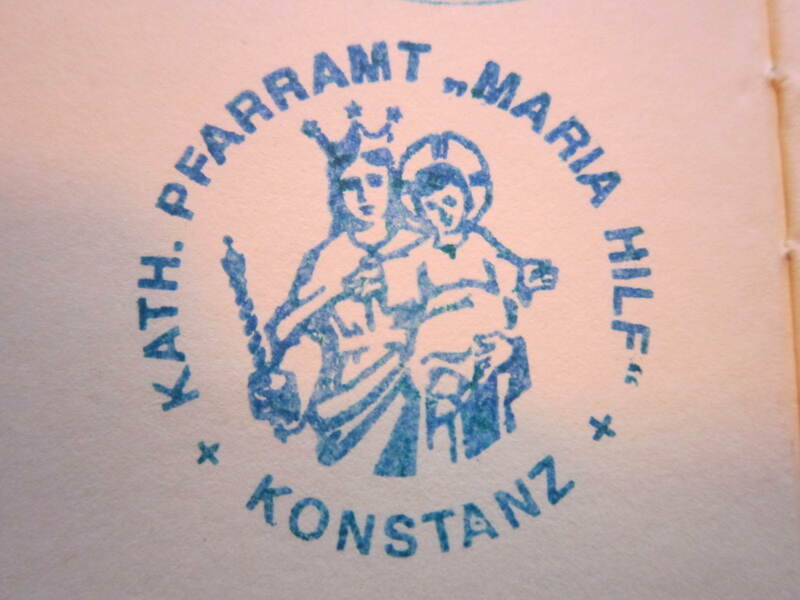 The Konstanz stamp in my Pilgrim’s Passport. 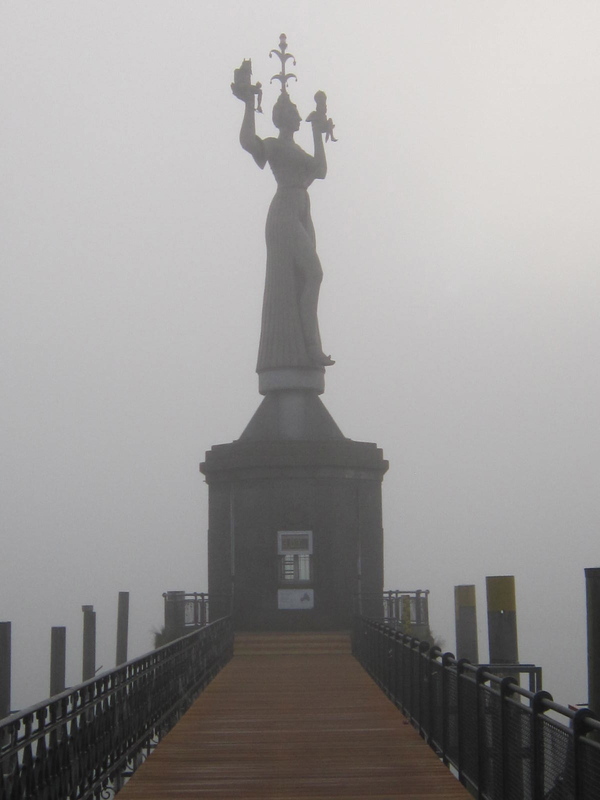 As I walked the mist-coated wooden planks to take the photo my attention was directed to one of the figures being held by the woman which looked like the devil. A slight shock came over me as when I approached the statue seemed to be turning with the devil image swinging in my direction. It turns out that the statue rotates all day long. 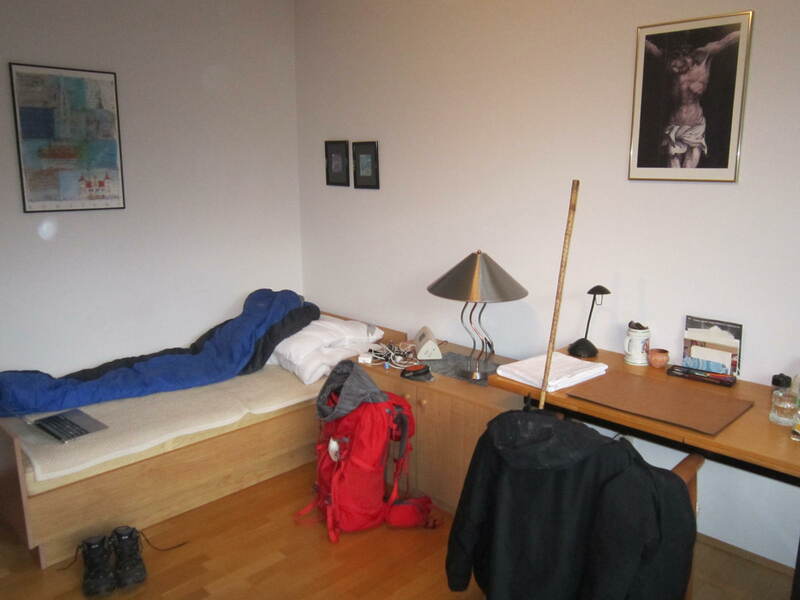 Well, today will be my last day in Germany before I cross the border over into Switzerland. I hope this message gets to you since I am not quite where I am emailing. I just finished reading down through your blog to Konstanz. It is absolutely brilliant… and funny, and thoughtful, and sweet. Thank you so much for putting it out there for us to enjoy and learn from. 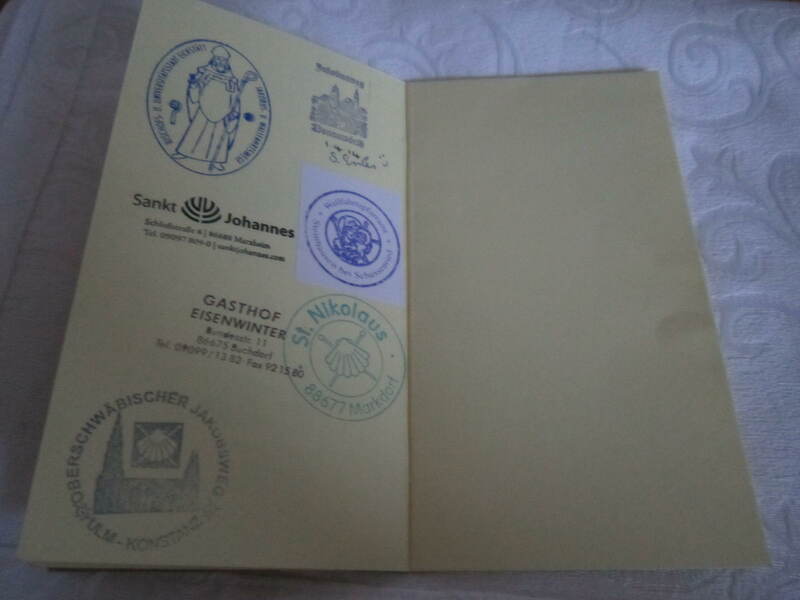 As I mentioned, there are several of us Americans planning on doing Nurnburg to Konstanz this summer, probably July. We are probably going to cross reference our path with your blog, but if you have any further ideas/suggestions on where we can get maps or information in english, that would be amazing. I am doing my best to get the rust out of my high school german, but it will be mediocre at best by July. I hope this finds you well, and Buon Camino! Thank you very much for your compliments Debra. Also, you are very welcome to add a comment whenever you wish and I will get right back to you. For me the walk from Ulm to Konstanz was the least inspiring along the whole stretch which I walked (Prague to Finisterre). Of course, I met wonderful hospitality and truly amazing people but the actual walk itself was very frustrating because of the vague signage which came over as intuitive signage at best along many sections of the journey. Nurnburg – Oettingen – Donauworth – Augsburg – Bregenz. You could then cut across to Konstanz from Bregenz if Konstanz is an absolute must destination for you, or you could continue onwards to Einsielden in Switzerland where there is a beautiful monastery (https://mycaminosantiago.com/2014/04/10/einsiedeln-monastery/). Of course, you could always walks the Switzerland Camino in full instead and you definitely wouldn’t be disappointed with this choice. Pls feel free to fire away if you have any further questions.